The CPU is supported by 8 GB of DDR4 RAM. Solid State Storage 1TB HDD storage. Faulty products - Manufacturer & SaveOnTech 12 Month Warranty. Each product is processed in house by one of our engineers and assigned a grade based upon its condition and workings. Hard Disk 1TB. 15.6" Full HD Touch. Professionally Refurbished Grade A Product . For example, Earphones, VGA Cable, User Manual. Faulty products - Manufacturer & SaveOnTech 12 Month Warranty. The item will have been tested and where required may be professionally refurbished by our engineers. Type: Notebook/LaptopBrand: MEDIONProcessor: Intel Core i5 7th Gen.
Medion Erazer i5 8gb RAM 1TB 15.6 Inch Gaming Laptop. Used but in very good condition. Only had it since Christmas. Comes original box with all inserts and packaging. Original power cable. Any questions please ask . Dispatched with eBay delivery – Shutl 1 day. Model- P6681. Hard Drive- 650 GB HDD. Change of mind. Graphics Processor NVIDIA GeForce GTX 1050. Product Type Notebook. Included Accessories Power adapter. Security Slot Type Kensington security slot. Interfaces USB-C 3.1 ¦ 2 x USB 2.0 ¦ 3 x USB 3.0 ¦ LAN ¦ HDMI. 160 Gb HDD. Very good condition. 1TB HDD storage. 8GB RAM DDR4. Microsoft Windows 10. NVIDIA GTX 10 series 1050 graphics card with 4GB RAM GDDR5. Up to 4.4 hours battery life. 1 HDMI port. 1 Ethernet port. 1 USB 3.1 port. It is equipped with Nvidia GeForce :GTX 1050 4GB. INCLUDED E1210 NETBOOK, WITH BATTERY. FOR A RANGE OF DIFFICULT TO GET SPARE. PROFESSIONAL PROGRAM. TRAVEL CASE WITH ZIP. WORKING WITH WINDOWS 7. Touch operation, many interfaces and a display that can be folded back by 300 ° make the notebook exceptionally versatile and flexible. This allows, for example, a standing position with the housing bottom pointing to the rear. Brand: MEDIONProcessor: Intel Core i3 3rd Gen.
Collection station availableType: Notebook/LaptopBrand: MEDIONProcessor: Intel Core i5 8th Gen.
Medion Akoya E6227 - 15.6" - 4 GB RAM - 500 GB HDD Laptop. TO COLLECT[CROYDON]! Used.The laptop was bought 3 years ago and works perfectly. I have tested it and it works very well. The only thing not tested is the CD drive as I have never used it and as I don't have CDs never tested it. Used, but in good working order. The ERAZER’s aggressive chassis design features a part aluminium design providing style whilst maintaining portability for gaming on the move. Our German design and quality is at the forefront of the ERAZER range. The housing of the ERAZER looks tough but not too exaggerated, due to the matt black rubberized finish and the ERAZER blue lines, the laptop stands out considerably without it being too crowded. To make it easier to play a shooter for example, the WASD keys are already marked with arrows. Brand: MEDIONProcessor: Intel Core i5 8th Gen. Item is otherwise complete with all accessories. 12 months warranty supplied. 12 months warranty on all products. Unit 63-64 Leyland Trading Estate. This item is Refurbished Grade B . Has a built in webcam, wireless and dvdrw drive etc. Screen has no nasty marks, clear and bright, its perfect. Area around the keyboard and screen is excellent. Keyboard is clean and good working order. Full HD display. Bought 1 year ago. It`s good for web browsing and youtube but not for more advanced tasks. Open Office and ad blocker installed. This model doesn`t have DVD drive. No original box. 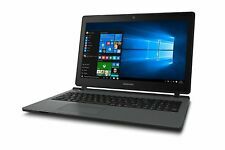 Medion Erazer P6679 15.6" Gaming Laptop Intel Core i5-7200U, 8GB RAM, 1TB HDD. Brand: MEDIONProcessor: Intel Core i5 1st Gen.
8GB RAM with integrated 256 GB SSD and 2TB HDD. NVIDIA GeForce GTX 950m. NVIDIA GTX 9 seriesGTX 950m graphics card. 2TB HDD and SSD storage. Refurbished Product - An item that Is fully Functional and 100% Working. Type: Notebook/LaptopBrand: MEDIONProcessor: Intel Core i7 7th Gen.
Medion P6681 15.6 Inch i5 3.1GHz 8GB 1TB HDD 128GB SSD GTX1050 Gaming Laptop. 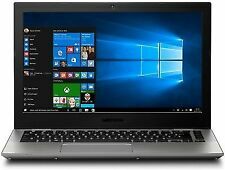 5 out of 5 stars - Medion P6681 15.6 Inch i5 3.1GHz 8GB 1TB HDD 128GB SSD GTX1050 Gaming Laptop. 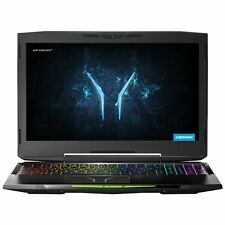 1 product rating1 product ratings - Medion P6681 15.6 Inch i5 3.1GHz 8GB 1TB HDD 128GB SSD GTX1050 Gaming Laptop. Est. delivery dateEst. delivery Thu, Apr 25Type: Notebook/LaptopBrand: MEDIONProcessor: Intel Core i5 7th Gen.
8GB DDR4 1TB HDD. Turbo boost up to 3.4GHz. Hard Drive. Optical Drive. Up to 4.4 hours battery life. In this case, the Supplier will inform you of any delay as soon as possible and will give you the option of cancelling your order at this point. 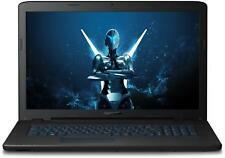 Type: UltrabookBrand: MEDIONProcessor: Intel Core i3 7th Gen.
128GB M.2 SSD 1000GB HDD. Hard Drive 1000GB. Solid State Drive 128GB SSD. 8GB DDR4 RAM. The in-built bluetooth 4.2 allows you to connect wireless mice, headsets and more. RAM 8GB (DDR4). Optical Drive DVD RW. This chassis features discrete Gaming styling allowing the device to be used for Gaming and work. Hard Disk 1TB. Professionally Refurbished Grade A Product . For example, Earphones, VGA Cable, User Manual. 4GB RAM 256GB SSD. Hard Drive. Optical Drive. Up to 7 hours battery life. In this case, the Supplier will inform you of any delay as soon as possible and will give you the option of cancelling your order at this point. 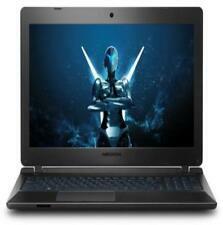 Type: Notebook/LaptopBrand: MEDIONProcessor: Intel Core i5 8th Gen.
Model- P6679. Graphics- NVIDIA GeForce GTX 950M. Change of mind. 1TB HDD storage. Microsoft Windows 10. Item Details. Size H2, W26, D38cm. Up to 5 hours battery life. General features Dolby sound system. Built-in mic. Storage 1TB 128GB SSD. Professionally Refurbished Product . For example, Earphones, VGA Cable, User Manual. At Least 12 Months Warranty. All Accessories Included. Grading Policy. Faulty products - Manufacturer & SaveOnTech 12 Month Warranty. Model number: 30025006. 1TB and 256GB HDD and SSD storage. NVIDIA GTX 10 series GTX 1060 graphics card with 6GB RAM GDDR5. 8GB RAM DDR4. Quad core processor. About this product. Getting the Right Products for You Each and every order you place is checked by one of our experienced sales team. ATI AMD Radeon X1250 Graphics. AMD Sempron. 150GB Western Digital HDD. AMD High Definition Audio Device. 2.00GB DDR2 RAM. Windows 7 PRO 64-bit. Sumatra PDF; Slim PDF reader. Speccy; Detailed system hardware specification viewer. Work and play?. 8GB RAM and 1TB HDD this unit can do it all. 1TB HDD storage. NVIDIA GTX 1050 graphics card with 4GB RAM. Microsoft Windows 10. Weight 2kg. Size H2, W26, D38cm. Up to 5 hours battery life. 1000GB HDD. Hard Drive 1000GB. Dedicated GeForce GTX 1050 4GB Graphics. 8GB DDR4 RAM. Solid State Drive No SSD Storage Included. Optical Drive DVD Rewriter (Records DVDs 8x & CDs 24x & Dual Layer Super Multi). Total storage capacity 256GB 1TB HDD. 256GB SSD 1000GB HDD. GeForce GTX 1050Ti Graphics card. Processor boost frequency 3.50 GHz. Product Type Notebook. 4 Hours Battery Life. Processor cores 2. Performance you can count on. 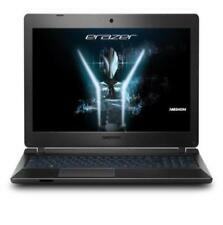 MEDION ERAZER P6689 is a high-end gaming laptop. The Intel Core i5-8250U 8th gen processor and 4 GB NVIDIA GeForce GTX 1050 graphics provides high-definition gaming fun at maximum detail levels! 16GB RAM and 2TB HDD provide ample memory and storage for smooth running. Windows 10 home is pre-installed. It's great for studying, working on essays, streaming TV on demand, and browsing the web. Getting the Right Products for You Each and every order you place is checked by one of our experienced sales team.